E+E Showtime invites you to take part in the 10th Annual Texas Union Film Festival! The event showcases and celebrates the rich tradition of student filmaking at the University and seeks to connect students with the Austin film community. Do you have a passion for filmmaking that you want the world to see? Submit your film for competition and screening at TUFF! The competition is open to all students regardless of major. Submissions are open until February 14th, 2019. 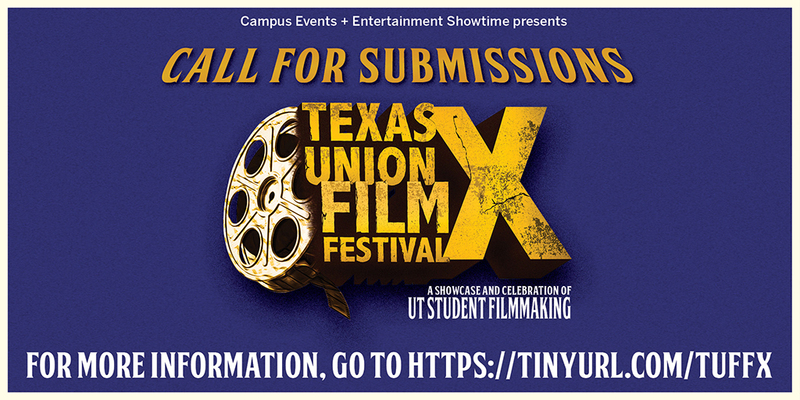 Films must be submitted to the Campus Events + Entertainment Office in the Texas Union (UNB 4.312). Films for the competition should be under 10 minutes in length. Exceptions to the length may be made on a case-by-case basis. Films must be submitted on a USB drive or DVD. The submission must be filmed off of the UT campus unless made for an academic course. Films up to two (2) years old may be used. No work from high school will be accepted. Each student may submit more than one film, but only one may be selected to be screened at the festival. Submission forms can be downloaded here (TUFF Submission Form-updated.pdf) or picked up at the Campus Events + Entertainment Office (UNB 4.312) starting on November 1, 2018. Films must be submitted to the E+E Office in person by February 14, 2019. For more information, please visit https://tinyurl.com/TUFFX.